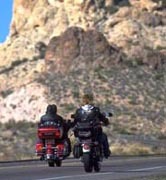 Motorcycles are becoming an ever-more popular mode of transportation in the United States. However, the increase in the popularity of motorcycles inevitably leads to an increase in motorcycle accidents.Per vehicle mile traveled in 2006, motorcyclists were about 35 times more likely than passenger car occupants to die in a motor vehicle traffic crash and 8 times more likely to be injured. While motorcycles made up no more than 3% of all registered vehicles in the U.S., motorcyclists account for 13% of total traffic deaths. Unfortunately, when motorcyclists are involved in accidents with passenger vehicles, motorcycle riders and their passengers are also more likely to suffer serious injury and death as a result. RobertsMiceli LLP offers aggressive, professional representation to motorcycle accident victims. In all matters involving personal injury it is essential that measures be taken promptly to preserve evidence, investigate the accident in question, and file a lawsuit prior to the deadline imposed by the Statute of Limitations. If you or a loved one is a victim of personal injuries, call RobertsMiceli LLP now at or submit a simple Case Review Form. The initial consultation is free of charge, and if we agree to accept your case, we will work on a Contingent Fee basis, which means we get paid for our services only if there is a monetary award or recovery of funds. Don't delay! You may have a valid claim and be entitled to compensation for your injuries, but a lawsuit must be filed before the statute of limitations expires.